Peggy Fleming has worked mainly in the financial services industry for over 35 years. She is currently Director of Communications at a community bank where she built their first Intranet, writes the employee newsletter, designs forms, documents and presentations, facilitates events and employee community involvement, and manages promotional materials. Peggy earned her BA in Journalism from Drake University in Des Moines where she belonged to the student chapter of Women in Communications, Inc. (now AWC). 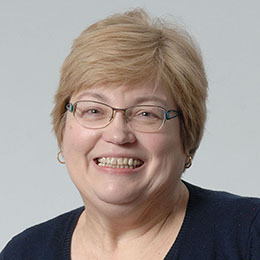 While working as a technical writer at The Principal Financial Group, Peggy helped to found a local chapter of the Society for Technical Communications. Returning to AWC in 2007, she has served as Secretary and Communications Chair in the Greater Des Moines Chapter and is now Chapter President. She also serves as Co-Chair of the Marketing/Communications Committee on the national level. For over 25 years she has also been an internationally known teddy bear artist and show promoter which has given her a unique perspective on marketing and event planning. Peggy and her husband have three grown children and now dote on two adorable West Highland White Terriers and an ancient toothless cat whose antics are chronicled on Facebook and Instagram.